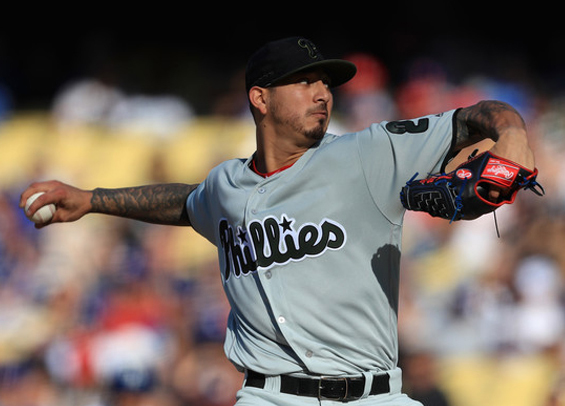 Vince Velasquez pieced together a strong performance in front of friends and family at Dodger Stadium, but a series of late-inning blunders doomed the Phillies in their first contest to open a 10-game road trip. The antics began in the eighth inning as Maikel Franco couldn't handle a hard-hit bouncer by Yasiel Puig that caromed off his glove and over to Scott Kingery at shortstop. Pinch-hitter Matt Kemp then tagged a 99-mph Luis Garcia fastball for a double, scoring Puig and bringing the Dodgers to within a run. Pinch-hitter Enrique Hernandez lofted a sky-high pop to second base, but Cesar Hernandez lost sight of the ball before it eventually fell in short center field. With runners on the corners and nobody out Max Muncy followed with a chopper back to Adam Morgan, but the ball bounced off the tip of his glove enabling Kemp to score to even the contest 4-4. Hernandez eventually crossed the plate on a Yasmani Grandal hit to left to give the Dodgers a one-run advantage and ultimately a victory. It was a tough loss for the Phillies, particularly because the circumstances oddly resembled a defeat last year at Dodger Stadium that precipitated a tailspin that saw the Phillies win just 18 games over the next three months of the season. That time it was a trio of homers given up in succession that cost the Phillies, this time it was an odd grouping of miscues that erased an otherwise strong start. "Try to forget the day," Maikel Franco told reporters afterward. "Tomorrow is a new day. What happened last year is not going to happen. It's not going to be the same thing." Velasquez didn't surrender a hit through five innings before surrendering a pair of runs in the sixth. He struck out six and lowered his ERA on the year to 4.08. The Phillies jumped on Dodgers' starter Brock Stewart early, scoring a run in the opening frame without even recording a hit. Rhys Hoskins reached via catcher's interference while Odubel Herrera and Carlos Santana worked back-to-back walks. Stewart than uncorked a wild pitch, allowing Hoskins to scamper home to give the Phillies an early 1-0 advantage. Cesar Herandez launched a three-run homer in the second, crushing a first-pitch fastball over the fence in center to give the Phillies a 4-0 lead. As if the eighth inning wasn't bad enough for the Phillies, Hoskins was forced to leave in the ninth after fouling a pitch off his face. "He has a big, fat cut on the inside of his bottom lip," manager Gabe Kapler said (see video). "He's getting evaluated. I don't have anything definitive beyond that. I'm not overly concerned at this point. He just has a big cut on his lip." The two clubs resume their four-game set Tuesday night with Jake Arrieta facing righty Kenta Maeda. Beyond Velasquez and his start, Seranthony Dominguez again was a highlight for the Phillies. Over 1 1/3 innings, he collected three strikeouts and looked as dominant as ever. He's now tossed 11 2/3 innings at the big league level and surrendered just two hits, both singles.